If months were colours then May would definitely be green. There are little shoots and leaves appearing everywhere and I’m sure if you could stand still for long enough you would be able to see things growing. The hanging baskets have been planted ready for Summer and they’ve been left in a sheltered place until the risk of frost has passed. 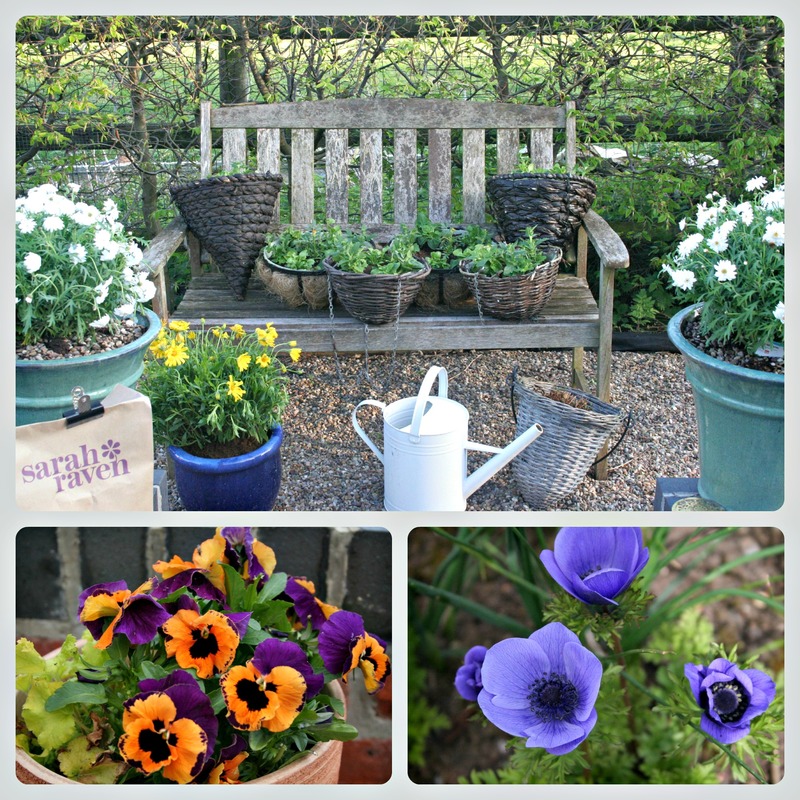 The pansies are still flowering well so I haven’t replaced them yet and I’m pleased to say that the Mr Fokker anemones are finally in bloom! Unfortunately, the war on slugs and snails has begun (well in truth it’s more like a little scuffle at the moment). The hosta pots have now got a band of copper tape around the rim which will hopefully deter the slimy molluscs from crossing it and helping themselves to an all day breakfast. I’ve also surrounded the chrysanthemums with crushed egg shells but this appears less successful as there are already holes in the tender leaves. I want to try the slug pubs and up turned grapefruits but in the meantime I would love to hear if you have any favourite natural solutions that would help? The chickens would have a feast but would probably do more damage than the slugs! The cats are also doing their best to help me with the gardening jobs. 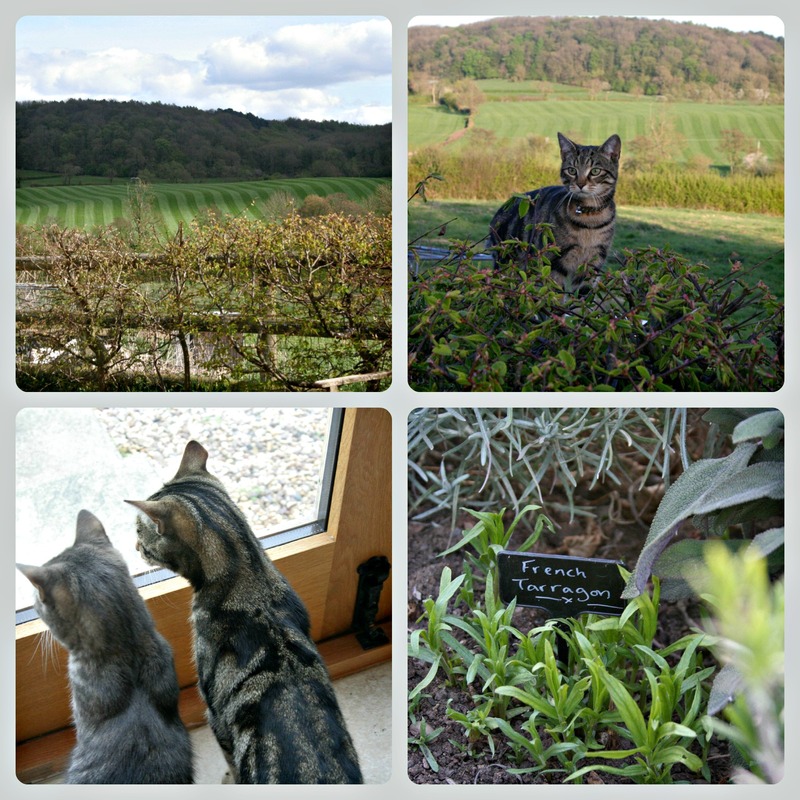 They love a spot of weeding (digging for no reason) and pest control (pouncing on anything that moves). It is lovely to have them outside in the garden with me and they love to show off, climb trees and race around the paddocks. They have been particularly entertained by the baby rabbits who are thankfully faster than they are! In the photo below Bella & Milo are absolutely transfixed on a rabbit on the other side of the window. The weather forecast remains poor – wind and rain for most of the weekend so garden plans are put on hold for now. Enjoy your weekend!